Use ReadyAPI assertions to validate response and request contents: response codes, header values, specific fields in JSON and XML response bodies, and so on. To learn more about available assertions and their parameters, see Assertion Reference. For any test step, add one or multiple assertions to check if it gets and returns data in expected format and functions correctly. Open a test step in the editor and click Add Assertion. Open a security test, click Response Assertions next to a security scan, and click in the Assertions panel. Expand the Assertions drop-down menu on the right of the virtual service editor and click . In the Add Assertion dialog, select an assertion category, pick an assertion, and click Add. The assertion will be added to the Assertions panel. Note: Some assertions may be missing from the dialog. It happens because they are not applicable to the currently selected test step or operation. The Recently category of the dialog lists 5 recently used assertions. Configure and order your assertions in the Assertions panel. A list of available assertions to clone. A project to clone the assertion to. A test suite to clone the assertion to. A test case to clone the assertion to. A list of available test steps to clone the assertion to. If the option is on, clones will replace such assertions in the target test steps. If the option is off, clones will not replace the existing assertions. The option does not affect multiple-instance assertions: ReadyAPI always adds copies of these assertions to the assertion list. Removes any existing assertions with the same name. Displays the list of updated test requests. 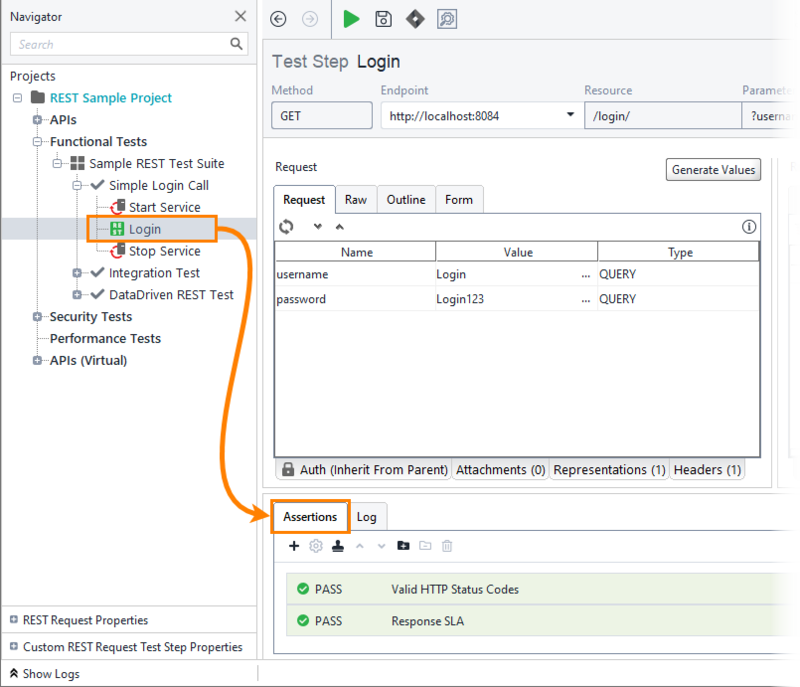 The Assertions panel lists the assertions you added to a test step or operation. Here, you can add and modify the assertions. Click to add a new assertion. 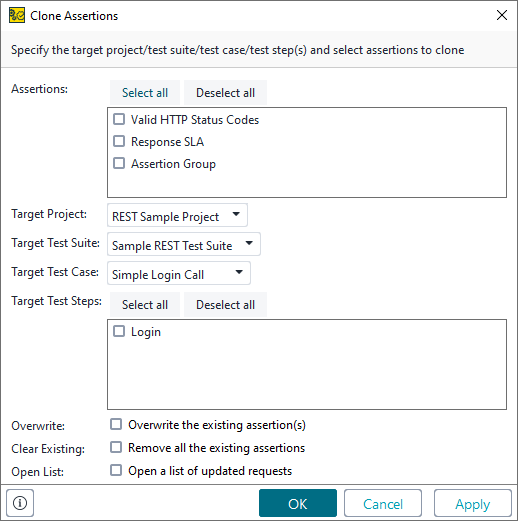 Click to copy the selected assertion with all its settings and parameters to another test step in the same or another test case or project. See Clone assertions for details. Click to delete the selected assertion. Click to change the position of the selected assertion in the panel. The assertion order is important. ReadyAPI runs assertions in the order you have specified, from the topmost to the bottom one.